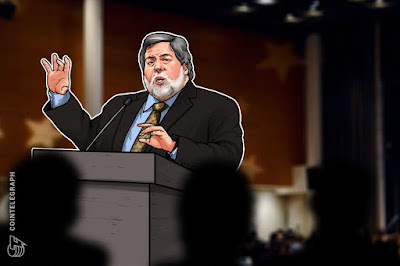 Apple co-founder Steve Wozniakbelieves that blockchain is a bubble similar to that of the dotcom era, but that it could have potential in the future, CNBC reported yesterday, June 26. Wozniak had expressed similar sentiments about the future potential for both blockchain and cryptocurrencies last month. CNBC notes that Wozniak singled out Ethereum (ETH) as one cryptocurrency that could last in the long term, due to its versatility in allowing developers to build on its blockchain. In mid-May at a conference in Vienna, Wozniak had also compared Ethereum’s platform to Apple’s platform, stating that it could become just as influential as Apple in the future. According to CNBC, Wozniak yesterday mentioned the possibility of using blockchain for a social network competitor to Facebook, which he said was currently working as a monopoly in the sector. Wozniak, who had referred to Bitcoin(BTC) as “pure digital gold” earlier this month, noted that Bitcoin is still "just amazing” to CNBC.